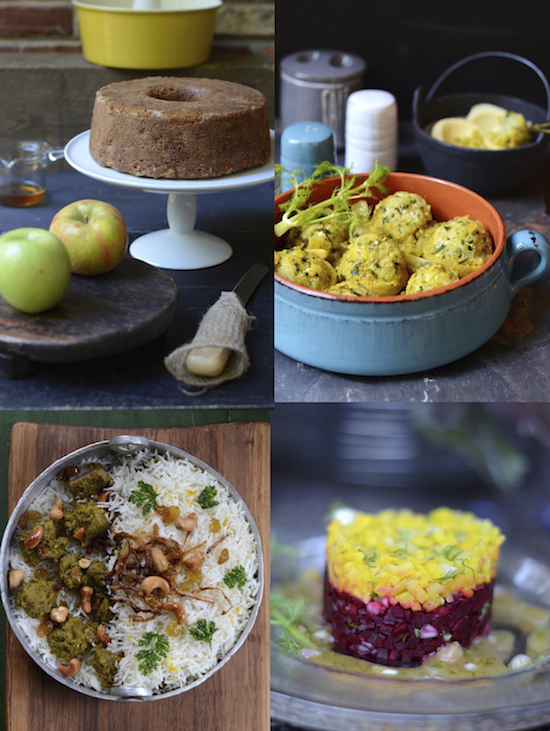 These are some of my favorite Rosh HaShanah recipes that I've posted over the years. This small sample encapsulates the way we celebrate the holiday. Bringing the essence of the fusion of cultures that we are to our Rosh HaShanah table. You have here from top left, clockwise, from the NYT Apple Bourbon Bundt Cake, my newly adopted Rosh HaShanah boozy dessert. Artichoke Bottoms Filled with Carp 'Meatballs' in Ouzo and Fennel Sauce, a delicious departure from gefilte fish and to change things around from my staple spicy Moroccan fish. My mom's original, Lamb Biryani is quite a feast. Probably the best biryani I have ever tasted. I of course make it nut-free. Last but not least, a sensational Golden and Red Beet Tartare with an Apple Cider and Dill Vinaigrette as a prelude to your holiday meal festivities. I can't celebrate this year's early bird, Rosh HaShanah (The Jewish New Year/5774), on the eve of September 4th, 2013/5774 without my classic round Honey Challah loaves. Kick it up a notch with my Quince Honey Challah Knots which appear in the Washington Post Cookbook. Wow, that's a great roundup. I love all the four in the picture. The tartare looks so fancy. The Quince Honey Challah sounds good..Hope you have great fun on Rosh HaShanah. Happy New Year. A very beautiful collection of posts Shulie. Lovely dishes! everything looks incredibly mouthwatering. Where do I start? And the point is I better get started. It seems so early this year! I MUST try that bourbon apple bundt cake...just the name is making my mouth water!!! Shulie, I need to make your Apple Bourbon Bundt Cake and your Honey Challah! Lovely holiday round-up. Thanks for sharing!